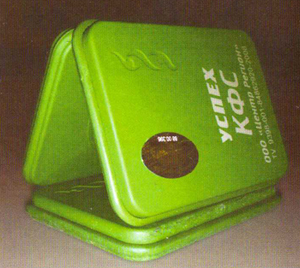 Functional State Correctors appeared at Russian market in 2008. The main purpose of FCSs is improvement of one’s life quality due to upbringing of one’s physical, energy and emotional states. The use of structured water and performing pumping are the basis of FSC implementation. By doing pumpings regularly one may speed up health restoration processes by orders, enjoy brilliant well-being and active longevity. - When eating, use FSC as a stand for dishes, in which the food lays, and for various liquids such as water, tea, coffee, juices and other beverages, including dressings and alcohol. - To be in positive moods. Pumping is a procedure of FSC use in accordance with some specific technology. In most cases it is placing FSCs at specified areas at the body in a definite sequence for some time intervals. The purpose of pumping is to accent health restoration and rejuvenation processes by giving energy-informational impulse to the body. In case you have only one FSC the pumping would not be very effective, nevertheless one shall do it. You will need another person to help you. You should lay down or stand up in order to keep the spinal column straight. Your assistant should move FSC slowly along the spinal column (from the coccyx to the head) making 1-2 minute stops at projection of energy centers. Then you should take FSC between palms of the hands, as if in a prayer, and slowly move it along the front surface of the body – from bottom to top, finishing the procedure at the level of the third eye chakra. In case you have no assistants, you may put an FSC under the coccyx and sit on it for 5 minutes, then put it at the seventh neck vertebrae for another 5 minutes. You take FSC into your hands and rotate it in hands, as if soaping hands. You may also move FSC slowly along hands, legs and the body, as if soaping. Make accent at feet and palms of the hands. Prior to “soaping” with FSC make a self massage of the body, by clapping the entire body with both hands, make palms of the hands the way shown at the picture. Pumping of vascular and bone systems – criss-cross pumping. This pumping is “must do” for everybody, one should do it every day. During this procedure the entire locomotive is pumped, along with nervous, immune, cardio-vascular, lymph and endocrine systems. It also improves electrolyte balance and metabolism. If there is such a possibility one may do it barefoot at the yard for better effect. Do it at least twice a day – morning and evenings. If you have two FCSs, place one of them under the left foot, close to fingers, and take the second one into the right hand with all fingers, hold for 2-5 minutes. Change FCSs positions, that is put the first one under the right foot, and the second – into the left hand and hold for another 2-5 minutes. It is important that time intervals for both positions should be equal. If you have four FCSs, place two of them under both feet and take the other two in both hands. Pumping with 4 FSCs requires 1-2 minutes. In case you have problems, connected with bone, cardio-vascular, nervous, immune, lymph, endocrine systems – it is recommended to do this pumping minimum 5 times a day for quick positive result. In acute periods one may do 7-12 pumping procedures a day. It is recommended to make equal time intervals between pumpings. When symptoms will be disbanded, do it twice a day in prophylaxis purposes. One may use relaxing musing when doing pumping, repeat affirmations. 8. 1 centimeter above the bridge of the nose – at the third eye level. It is desirable to perform this pumping mornings and evenings, one may also do additional rounds during the course of the day, depending on well-being. One shall have in mind that organism energy level rises up after this pumping, so people suffering with insomnia should not do it prior to going to bed, but several hours earlier. You take FSC no 1 from the blue series and “Love” from the green series and place them in parallel orientation – number 1 at the front surface of the body, “Love” at the back – at spinal column. Treat all points / chakras with these pair of FSCs. You may use other combinations of plates, for example: number 1 and “Harmony”, number 2 and “Healthy Generation”, number 3 and ”Woman’s Amulet”. This pumping opens up energy centers, removes blocks, muscle spasms, pains in the spinal column. One shall co-tune FSCs in order to perform this pumping. Take two FSCs. See the pictures below. Click -open external plastic cases and make sure that internal plates oriented the same way in both FSCs - holograms at the internal plates are under the face covers of external plastic cases. Place these FSCs at the surface, at which you are going to do the pumping (a sofa, coach, bed or floor), at first numbers (names) up, then turn one (any) FSC number down. After that pull FSCs apart, preserving their relative orientation, one of them should be under the coccyx, the other under the first neck vertebrae. Lay down at these FSCs for 1-5 minutes. Or one may also co-tune FSC no. 10 with “Healing” , “Danilovo lake”, 18, 20. One may do spinal column pumping in a sitting position, placing one FSC under the coccyx, and another one at the first neck vertebrae for 3-10 minutes. Place FSC number 1 or number 7 under the coccyx, and the second one (number 13 or number 10) under the first neck vertebrae. 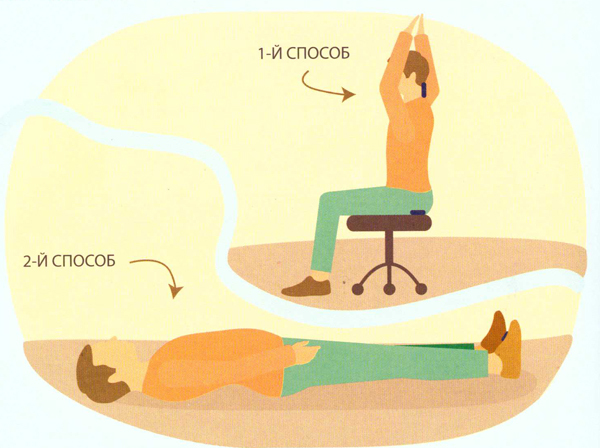 Rise your hands up above the head, making a “roof” and sit 3-10 minutes in this position. Repeat the procedure 5-7 times a day. In laying position place FSC number 16, at the feet, its short rib should be oriented towards the feet. Time varies from 2-5 minutes for beginners, till the whole night for those who are already accustomed to FCS energies. 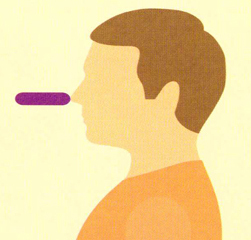 Should be used in case it is necessary to bring someone into senses quickly. 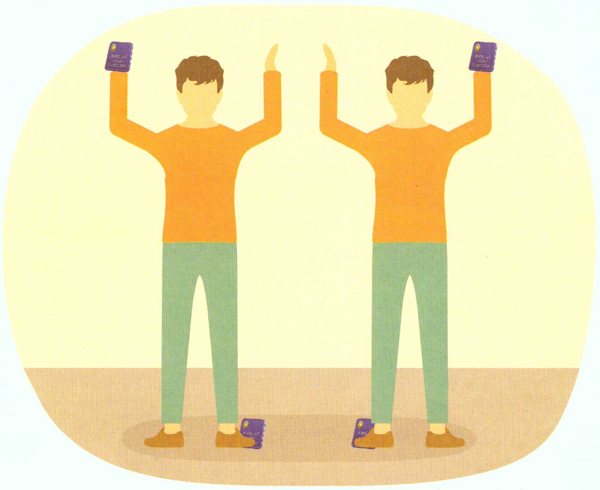 Put four FSCs at the person – one for each feet and one for each palm of the hand. Hold for 10-20 minutes. After that place 1 FSC at the back of the head. FSC no. 10 works well in case of fainting, loss of consciousness (it has special channel for the case). In case one is in coma, some relative who is taking care about the person, holds with his hands one FSC between the patient’s palms for 3-10 minutes, the other FSC lays under the patient’s coccyx. Place one FSC under the coccyx, the second one at the solar plexus, and the third – either at the third eye chakra or at the throat. This pumping works well in case of energy breakdowns. If there is such a possibility, select the required FSCs with a pendulum or with a computer diagnostic for each specific case. Four FSCs should be used for this pumping. Three of them should be assembled into the triangle, as shown at the picture. One may assemble triangle in two ways, when FSCs contact with long or short ribs, both variants are possible. One shall check the triangle performance with a pendulum. Rotate any FSC in the triangle along any axis and check energy with a pendulum again. Use a triangle with FCSs oriented in such a way, that ensures maximum energy output. (Even if you are not able to co-tune FSCs in a triangle, note that even not properly co-tuned triangle works better than a single FSC). One may use scotch tape or rubber circles to tie FCSs together. It is better to use blue or green FSCs for this pumping, it is possible to mix them up, thou it is not recommended to use lilac FSCs for this pumping. One FSC should be placed under the coccyx, the pumping scheme is the same as for the “Pumping of Energy Centers”, with the only difference that a triangle is used instead of a second FSC. This pumping is very effective in case of tumor processes and difficult pathologies. Exposition time for each point could be from 30 seconds to 10 minutes, it is obligatory to watch time closely and make equal time intervals between points. For example, after working with a triangle for 30 seconds, make 1,5 minutes break. If working for 1 minute – then 3 minutes break. Working for 10 minutes – 30 minutes break. One will need two blue FSCs, one should be placed under the coccyx, the second one – above the problem place – at the projection of diseased organ or some pathology process, with the exception of the heart area. For example in case of liver problems, the second FSC should be placed at the liver projection, in case of uterine pains – at the uterus projection and so on. The duration of pumping for each problem place should be from 30 seconds to 3 minutes. One may use a pair of FSCs in order to pump paired organs, for example, one may do kidneys pumping by placing two FSCs at the spine – at the projections of organs for 3-5 minutes. The distance between FSCs will be approximately 15 centimeters. In case of belly pains drink warm slightly salted water, structured at FSC number 2. Holding FSC no. 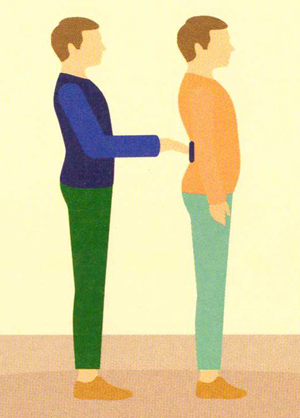 2 under your palm of the hand, massage the belly with circular movements. Massaging in clockwise direction will accent intestines performance. Massaging in counter-clockwise direction is good at diarrhea. If you understand that you are suffering from food intoxication, you should drink 1,5-2 liters of warm slightly salted water, structured at FSC no 2 , and in addition use FSC no. 5. All correctors are laid arbitrary at the floor at the step distance. One shall step over FSCs walking back and force. Effects achieved at the use of blue and green series include relieved tension, tone and feels improvement. Physiology effects include urogenital system pumping and vein blood flow in legs improvement. Merzlyakova Elena, who introduced this pumping, recommends to practice it in the morning time, and use this time to make plans for a day and for working with affirmations, due to powerful FSC influence affirmations work better and plans fulfill into life. In case various series of correctors are used for a pass, it is recommended to group them, that is, use all blue plates for one segment of the pass, then all green, and so on. One shall perform this pumping in case of prolapse of some organs. In this case one shall actively use FSC number 7, carry it slightly above the projection of the prolapsed organ. For example, in case of prolapsed kidneys, one shall carry FSC 7 between the blade bones. One shall also take shower with water structured at this FSC twice a day, and sleep with it. FSC number 2 should be used for this pumping, effect will be better if you will do exercises prior to the pumping and add some movements during the pumping procedure. One shall start doing this pumping in direction from the bottom to top. You shall place FSC with its short rib subsequently to the following points, holding it for 1-3 minute in each point. 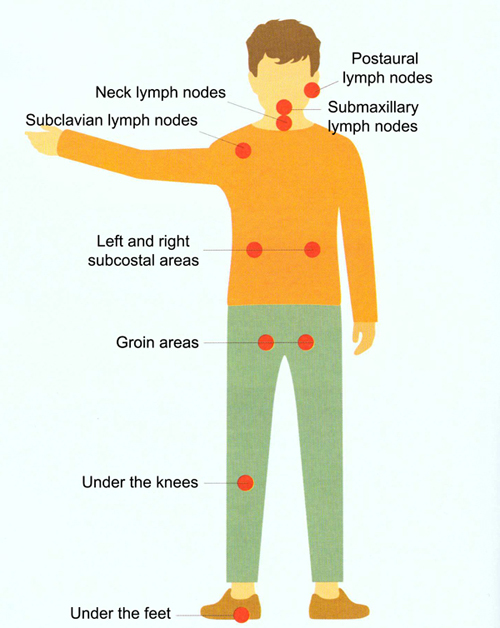 At the postaural lymph nodes, at that you do chewing movements. One may either do it first on the right side then at the left, or subsequently placing an FSC – right and left feet, right and left knee and so on. This pumping is not recommended for the beginners! One may use any FSCs (but if you are using lilac FSCs, do not open the channels – passive mode). You will need 11 Functional State Correctors. First you should co-tune 2 FSCs, the way it was described in “The Spinal Column Pumping” chapter. Place them – one under the coccyx and the other under the seventh neck vertebrae. FSCs should be oriented along the body. You lay down at these two FSCs and place other FSCs at the energy centers (at all 9 points shown at the scheme), these FSCs should be oriented transverse to the body. In case you are suffering from running nose, just take FSC number 16, its short rib should be directed at the nose tip. Pumping time is 10-15 minutes, perform it several times a day. This pumping is needed for prophylaxis of gynecology diseases, it is better to perform it in lying position, one may combine any blue and green FSCs. in case you have 10 FSCs you may place them at the areas, shown at the scheme – one FSC for each feet. Exposition time is 20-30 minutes. In case you have 3 FSCs, assemble a triangle and activate each point during 1 minute. Recommended only for experienced users, beginners should not do it. This pumping should be performed in motion. Place 2 blue FSCs (numbers 1 and 5) slightly below the ankles at both legs, on the internal side. Place FSC no. 2 at the sacrum. Simply do your usual sport training or exercises, duration from 20 to 60 minutes. 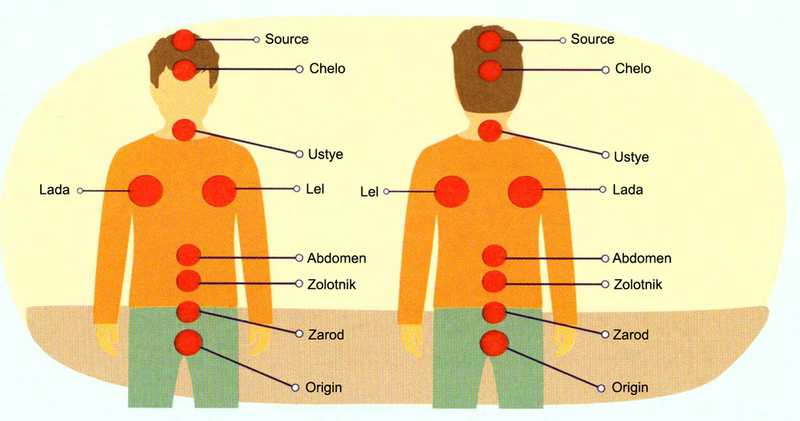 Slavonic system of energy centers counts 144 chakras. We are going to activate a number of energy centers, which are responsible for physical and spiritual development of a human being. The sequence of placing FSCs at specified chakras is very important, otherwise energy centers would not «switch on». It is better to use FSCs from the blue or green series, without mixing them up. Pose1. Put your hands at the hip joints both at the left and right sides for 5-10 minutes, waiting for the feeling of warmth in the legs and the body. At that, activation of hip joints chakras takes place, along with knees and feet joints chakras. Pose 2. This and all subsequent poses should take from 1 to 3 minutes. Put the right hand palm at «The Origin» (исток) chakra, it is situated in the perineum area, and the lest palm at «The Source» (Родник) it is situated at the crown of the head. Pose 3. Left hand covers «The Zarod» (Зарод) chakra at the front side of the body, Zarod is situated 3 fingers beyond the navel, the right hand covers the samе chakra at the back side of the body. Pose4. Left hand covers «The Zolotnik» (Золотник) chakra at the front side of the body, it is the navel place, the right hand cover the samе chakra at the back side of the body – at the lordotic bent of the spinal column. Pose 5. Left hand covers «The Abdomen» (Живот) chakra at the front side of the body, The Abdomen is situated 3 fingers above the navel, the right hand cover the samе chakra at the back side of the body. Pose 6. We activate «Lada» (Лада) and «Lel» (Лель) chakras. Place the left hand under the right collar bone, and rise the right hand back – under the left shoulder, the more the better. That is one embraces himself, the hands are in criss-cross manner. At that not only «Lada» and «Lel» chakras are activated, but also «Yarlo» (Ярло) chakra activates, energy exchange balance comes to norm – receiving and giving out of energy. Arterial pressure gradually comes into norm, which is violated due to improper energy balance of giving out and taking (in case one does not want or not able to give out and receive love). More to it, thymus gets additional power supply. Pose 7. Left hand covers on the front at the zone of the jugular notch, as if enclasping the neck, at the «Ustye» (Устье – deboucher); and the right hand should be placed at the back of the neck parallel to the left hand. Pose 8. Left hand covers the forehead from the front, at the «Chelo» chakra, and the right hand at the first neck vertebra area. The chakra of ascension activates at the same time. Pose 9. Repeat the pose 2. At that the right hand should be situated at the back of the body under the tailbone, as close to the perineum as possible, and the left hand at «The Source» chakra - the crown of the head. Pose 10. In addition it is possible to pump up the knee chakras, left hand is situated at the front side, the right at the rear; and feet – right hand should be placed under the foot and the left on top of it in parallel. Pumping of basic and minor chakras. In addition to 7 basic chakras human being has 21 minor chakras: feet, knees, groin chakras, navel chakras, spleen chakra, intercostal chakras, collarbone chakras, shoulder, elbow, palm of the hands chakras, ear chakras. Why it is important to pay attention at them and do pumpings with the help of FSCs? Because some diseases may appear due to problems in minor chakras. Feet chakras: callus formation, feet edema, heel spurs, hypertension, spasms (convulsions), epilepsy, coma, sleepiness, vertigo, headache, insomnia. Knee chakras: sciatica, arthritis, blood circulation violations, cystitis, pains in sacrum, back of the spine, hip joints. Groin chakras: pains in side areas, hip joints stiffness, cold feeling in the back of the spine, hernias, reduced sexual appetence, urology issues, low arterial pressure, vomiting, pains in the chest. Navel chakras (situated left and right from the navel): pains in the navel area, inoperable hernias, increased fatigability, bowel irritation syndrome. Spleen chakra: Womb diseases, breast tumors, menopause, autoimmune diseases. Intercostal chakras: debility, discomfort in extremities, fever diseases, shingles, vertigo. Collarbone chakras: thyroid gland hormonal disorders, neck stiffness, pains in the spinal column thorax department, calcium deficiency bone diseases, spondylitis. 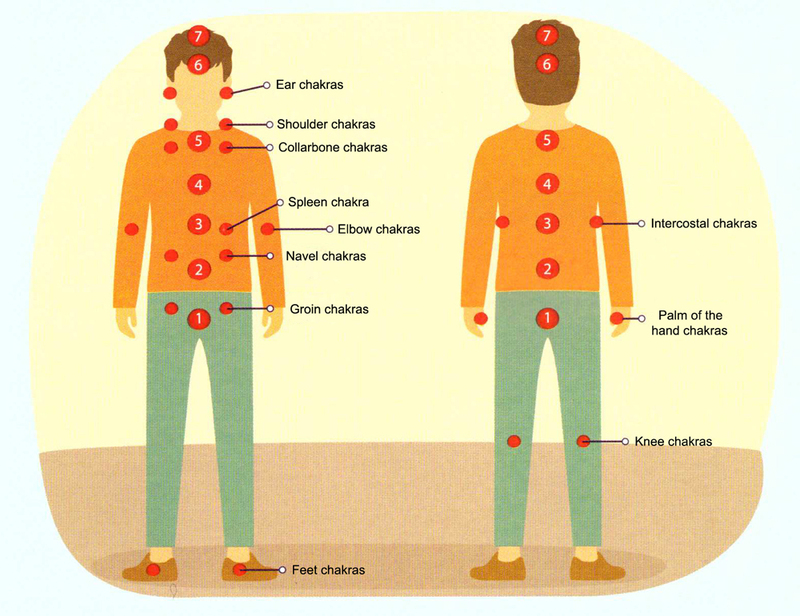 Shoulder chakras: shoulder pains, gastritis, intestinal disorders, diarrhea, depression. Elbow chakras: pains in elbow joints, arthritis, cold hands, cystitis. Palm of the hands chakras: fasciitis, Dupuytren’s contracture, palms skin and nails infections. Ear chakras: deafness, tinnitus, torticollis, traumatic otitis, facial paralysis, head spin, eye tension, diaphragm pains, shingles. Then 5 FSCs are used simultaneously. Two of them should be placed under the feet – that is to the feet chakras. Two at the palms of the hands, and the fifth corrector at the 7-th chakra. Place 2 FSCs at the knee chakras, on the back side – under the knees, another 2 FSCs should be placed at the elbow chakras, the fifth – at the 1-st chakra. Put two FSCs at the groin chakras, two at the collarbone chakras, the fifth at the 6-th chakra. Place 2 FSC at the ear chakras, two at the intercostal chakras, the fifth - at the 4-th chakra. Place 2 FSC at the shoulder chakras, 2 FSCs at the navel chakras, the fifth one at the 5-th chakra. Everyone builds plans, at least for tomorrow. These plans will come to realization with better probability if you will start to practice the following procedure. In the evening you take a clean sheet of paper and write down your plans for the next day. Bent this sheet of paper and lay it down at FSC “Success”. Put a glass on top of it and pour some water. Drain this water in one gulp and pour the glass again. Next morning you shall drain the second glass in one gulp. After that do the following pumping: place FSC number 16 under the coccyx and move FSC “Success” along energy centers (from bottom to top), stopping at each center for 1-2 minutes. Be sure, after such pumping the probability of your plans realization will be 80-99 percent! In all these pumpings one shall have drink some structured water, take care to structure needed water beforehand. «Pulverize» means pouring structured water into pulverizer – the kind hair-stylists are using, and pulverize the body all over. Second best option is to sprinkle yourself with structured water. This pumping should be done strictly after criss-cross pumping. Structure some water at the Collection FSC “Velikoretskiy”, drink a glass of this water and pulverize some at yourself. First part is similar to the criss-cross pumping. Put FSCs 5 and 6 under the feet, take in hands FSC 9 “The Healthy Heart” and “Velikoretskiy”. Pumping time is 3-7 minutes. The second stage should be done in laying position, legs should be bent at knees. Drink a half glass of water, structured at FSC “Velikoretskiy”, put the listed FSCs at the specified places and lay for some 20 minutes. When finished pulverize yourself with water, structured at FSC no 9. Pumping time is 15 minutes or more. When finished pulverize yourself with water, structured at FSC “The Winner”. Structure some water at FSC “The Winner” beforehand. “Healthy Generation” – 1st chakra – hold it between the legs, FSC “Healing” at the sacrum, FSC “Success” at the back of the spine, FSCs “Harmony” and “Woman’s Amulet” – at the projections of kidneys, FSC “Love” between shoulder bones, FSC “Healing 2” at the 7-th neck vertebra, FSC “Amaranth” above the FSC “Healing 2” in horizontal orientation. Pumping time is 20 minutes, when finished drink water structured at FSC “Amaranth” (prepare structured water beforehand) and pulverize yourself with water, structured at FSC “Longevity”. Optional variant – one may at the same time put blue FSCs (numbers 1-7) at the front aspects of chakras. When doing this pumping one may experience noise in the ears, it is normal, it is a process of spiritual vision opening. Be sure to pulverize / sprinkle yourself with structured water in order to strengthen the field after the pumping end. One shall drink a glass of water, structured at FSC no 18 “Synchronization”. One shall co-tune FSCs 18-20-24, check co-tuning with pendulum if necessary. (look at chapter 8 in “FCS Manual” about co-tuning – pages 80-81). Sit on these co-tuned FSCs and also put “An Apple of Youth” at the 7-th neck vertebra. Pumping time is 20 minutes, do it every day. At the beginning women shall drink a glass of water, structured at FSC “Love Formula Yin”, men – at “Love Formula Yan”. After that do criss-cross pumping with these FSCs in two steps, first: Yan under the right feet, Yin in the left hand; second: Yin under the left feet, Yan Yin in the right hand. Third stage – one shall sit at FSC “Love Formula Yan” (it is under the coccyx) and “Love Formula Yin” is at the seventh neck vertebra. Fourth stage – put FSCs at the kidneys: women shall put Yan at the left kidney and Yin at the right kidney; men shall put Yan at the right kidney, Yin at the left kidney. 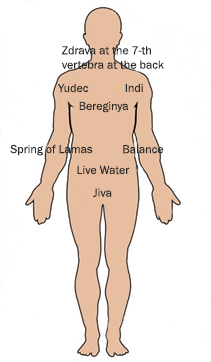 Fourth stage –put FSCs Yin and Yan at Lada and Lelya chakras – below the collarbones. 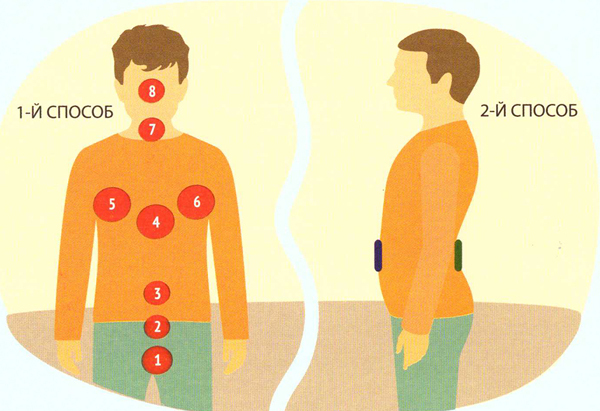 Sixth stage – Take Yin and Yan FSCs in hands and change their position 5-7 times, re-laying from one hand into another. At the end women shall pulverize themselves with water, structured at FSC“Love Formula Yin”, men – with water, structured at “Love Formula Yan”. FSC “Zdrava” at the 7-th neck vertebra at the back. Exposition time is 20 minutes. When finished pulverise yourself with water, structured at FSC “Bereginya”. Prior to doing this pumping it is obligatory to drink water, structured either at FSC “The Mighty Water” or “Phoenix”. “Energy of Life” pendant first at the thymus gland then at the seventh neck vertebra. You may substitute “Energy of Life” pendant with the “Phoenix” FSC. Pumping time is 20 minutes, when finished drink water structured at FSC “Reboot Filling” and also pulverize yourself with the same water. Drink some water, structured at FSC no 15 and also pulverize yourself with the same water. Pumping is similar to criss-cros pumping: Put FSCs “Danilovo Lake” and “Lurking Lake” under the feet, take in hands FSCs “The Sacred Cave” and “Golden Sand” and also hold FSC “The Apple of Youth” under the first chackra – tight it with the inner surfaces of your hips. Pumping time is 3-7 minutes. When finished drink some water, structured at FSC “Golden Sand” and pulverize your self with water, structured at “The Sacred Cave”. For the stomach: sit down at FSC “The Mighty Water”, put “The Tuning Fork” at the third chakra at the back, and at the front (of the third chakra) put either “Spring of Health” or no 5. Then change places of “The Tuning Fork” and “Spring of Health”. Best time for this pumping is from 7 a.m. untill 9 a.m.
For the pancreas: put FSC “The Tuning Fork” in pair with FSC “Balance” or FSC no 5 at the third chakra but from 9 a.m. untill 11 a.m. Change FSCs places approximately after half time of your pumping. For the cardio-vascular system put FSC “The Tuning Fork” at the right wrist and FSC “Velikoretskiy” or “Longeivity” at the left wrist. Do it in the time interval from 11 a.m. untill 1 p.m.
For the thin intestine: put FSC “The Tuning Fork” in pair with FSC 2 at the third chakra. Do it in the time interval from 1 p.m. untill 3 p.m.
For the urinary bladder put FSC “The Tuning Fork” in pair with “Nephrite” at the 2-nd chakra. One at the front surface, another at the rear. Do it in the time interval from 3 p.m. untill 5 p.m.
For the kidneys put FSC “The Tuning Fork” in pair with “Nephrite” at the kidneys area. One at the front surface, another at the rear. After 5 minutes change FSCs positions. Do it in the time interval from 5 p.m. untill 7 p.m.
For the reproductive system put FSC “The Tuning Fork” in pair with “Bereginya” for women, and in pair eithther with “The Black Mountain” or no 4 for men, at the 2-nd chakra. One at the front surface, another at the rear. Do it in the time interval from 7 p.m. untill 9 p.m.
For the thyroid gland put FSC “The Tuning Fork” at the back surface of the fiffth chakra in pair with “Yudek” at the front surface. Do it either in the time interval from 9 p.m. untill 11 p.m. or from 9 a.m. until 11 a.m.
For the liver: first - put FSC “The Tuning Fork” in pair with FSC 5 at the 3-rd chakra or at the area below the right hypochondrium and hold for 5 minutes. Second – put at the same places FSC “The Tuning Fork” in pair with “The Spring of Lamas”. One shall do this pumping two hours before going to sleep. For the bronchi-pulmonary system first put FSCs “The Healty Lungs” and “Extra ENT” under the collarbones and “The Tuning Fork” at the thymus. Second – put FSCs “The Healty Lungs” and “Extra ENT” under the shoulderblade bones and “The Tuning Fork” between the shoulderblade bones. Do it in the time interval from 3 a.m. untill 5 a.m.
For the large intestine: put FSC “The Tuning Fork” in pair with FSC 2 at the third chakra. At front and rear surfaces. Or you may use “The Tuning Fork” in pair with “Spring of Health 2”. Do it untill 7 p.m. Drink half glass of water, structured at FSC no 1. Do a criss-cross pumping during 3-7 minutes, use the following FSCs: No 1 antiparasite, no 14 “the Golden Pyramid”, “Healing 2”, “Olgyr”. Again sprinkle yourself with water, structured at FSC “Natural Antibiotic”. After 20 minutes finish the pumping with drinking water, structured at FSC “Olgyr” and sprinkle / pulverize yourself with water, structured at the “Golden Pyramid” FSC. Drink water, structured at FSC “Anticataclyzm”. Pulverize yourself with water, structured at FSC “Harmony”. Sit down at FSC no 1 and tie FSCs “Love” and “Harmony” at the kidneys. At the same time / in addition tie FSC “Lhasa” either at the throid gland projection or at the throat chakra, and tie /fix FSC 11 at the seventh neck vertebra. Pumping time is 7-10 minutes, at the end drink some water, structured at FSC 1 and pulverize yourself with water, structured at FSC “Lhasa”. Before starting this pumping hold FSC 17 between palms of your hands for 5 minutes. After that take some tap water into your mouth (not structured), rinse mouth cavity and spit it out. Put FSC “Olgyr” under the first chakra – tie it with the inner surfaces of the hips, FSC “Phoenix” should be at the thyroid gland. Put FSC no 20 at the 7-th neck vertebra, no 17 at the top of the head and numbers 21 and 23 either at the hip joints or the hips, at that stand at FSCs “Reboot Cleaning” and “Healing”. Harmonyzing pumping by Gusarova Tatyana Alekseevna: put FSC “The Tuning Fork” at the rear projection of the third chakra and FSC “love” at the front projection of the third chakra – at the solar plexus. Pumping purpose is removing of excessive liquids out of the patient’s organism. 9th position: sit down at the FSC 9 “The Healthy Heart” and fix / put FSC “Amaranth: at the second neck vertebra. FSCs should be in vertical orientation. Indications for this pumping: uterine or hemorrhoidal bleedings, thrombophflebitis, congestions in small pelvis, edemas of pregnant women – also useful for the fetus. In case of bleedings one shall do this pumping twice a day until the bleeding ends plus two more days after the end of the bleedings. In case of pregnancy and congestions in small pelvis one shall do this pumping during 7-14 days. Drink one glass of water, structurea at the “Clear Vision 2” FSC and pulverize yourself with the same water. Sit down at FSC “Clear Vision”, put “Clear Vision 2” at the left eye and at the same time put FSC “Velikoretskiy” at the right optical thalamus at the back of the head. Time 3-7 minutes. Siting at FSC “Clear Vision”, put “Clear Vision 2” at the right eye and at the same time put FSC “Velikoretskiy” at the left optical thalamus at the back of the head. Time 3-7 minutes. When finished drink a glass of water, structured at FSC “Velikoretskiy” and pulverize yourself with the same water.